When the Allies invaded the Crimea in 1854, they were taking on a vast empire that could call upon an army of over 900,000 men. Although undoubtedly brave, these men were more poorly equipped and trained than their opponents, and generally worse led. Yet it was they who were expected to expel the forces of the major industrialised powers of France and Britain, and their failure to do so had far-reaching effects on their country. This collection of over 40 figures includes a wide range of activities, with a high proportion apparently engaged in close-quarter combat. The Russian ethos of trusting to cold steel rather than firepower explains this, although against the bullets of the Western Powers they seldom had the opportunity to practice it. There are some firing poses, but interestingly no kneeling or prone ones, which again suggests the Russian character of always moving forward, regardless of casualties or danger to oneself. It seems therefore that the poses embody the Russian military attitude, and yet the reality of mid nineteenth century warfare meant this attitude resulted in little success and massive casualties, but the only such figure is a man with a minor head wound. The poses are interesting, although many are let down by their realisation. The man tearing at his shirt (second row, last figure) is, so we are told, a classic Russian sign of frustration - perhaps you have to be Russian to understand why. One of the most notable features of the set is that fully two-thirds are wearing a helmet. This item was only seen in the field at the very start of the war, and so is a rarity for the war as a whole. However we understand that this set is themed around the early months of the war, and a further late-war set may be produced in the future. Still the helmet is not really as tall as it should be. The other major feature of the uniform is the greatcoat, which most of these men wear. Some have it full length (to the ankles), while the majority have it tucked up to allow easier movement, which is authentic. Most have the cross-belts, correctly placed high on the chest, from which the cartridge pouch and bayonet were suspended. However virtually all have their pouch in the middle of their backs rather than on the right hip, where it belongs, and no one has been given a bayonet scabbard. 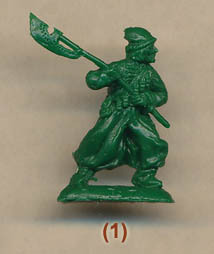 Instead, most have a short sword, which was an unusual item (mostly worn by grenadiers/elite, one quarter of a battalion) and should not have been included so often. All the men wear their knapsacks with round valise and canteen strapped to the back, but the packs are incorrectly done held by straps around the shoulder when they were actually held by cross-belts. The sculptor of this set cannot, in our view, claim to be a master of his craft. Detail is on occasion vague and poorly defined, but this is in part due to the manufacturing process. However there are problems which are purely down to the sculptor. Some of the poses such as row 1 - figure 1, row 2 - figure 2 and row 7 - figure 4 are simply unbelievable, with the first and last of these having their musket pass straight through their arm and neck respectively. Many others are particularly awkward, with the men attempting to use their musket as a club being the worst examples. The sword that most men have is wrapped around their body and barely stands out from the coat. The drummer has a separate drum, but this does not join well and must be glued, while the officer is OK except that he is missing his gorget. The Russian infantry is the most important element in any Crimean collection - they alone were involved in every battle of that campaign. However we were not impressed by this set. Many of the figures are perfectly usable, but some are little more than a waste of plastic. To their credit Strelets have resolved their early problems with flash - there is none at all here, although the figures are attached to the sprue by the usual massively thick strands - but some of the poses are either poorly chosen or poorly executed, and some surprising problems with accuracy make this set a disappointment overall.